Vancouver, British Columbia - Lumina Gold Corp. (TSXV: LUM) (OTC: LUMAF) (the "Company" or "Lumina") is pleased to announce additional drill results from the Cangrejos infill, step-out and depth extension program. These nine holes (C18-81 to C18-89) represent 3,678 metres of drilling, bringing the 2018 total to 7,417 metres. The Company is continuing to drill at the property and is currently on hole number C18-91. 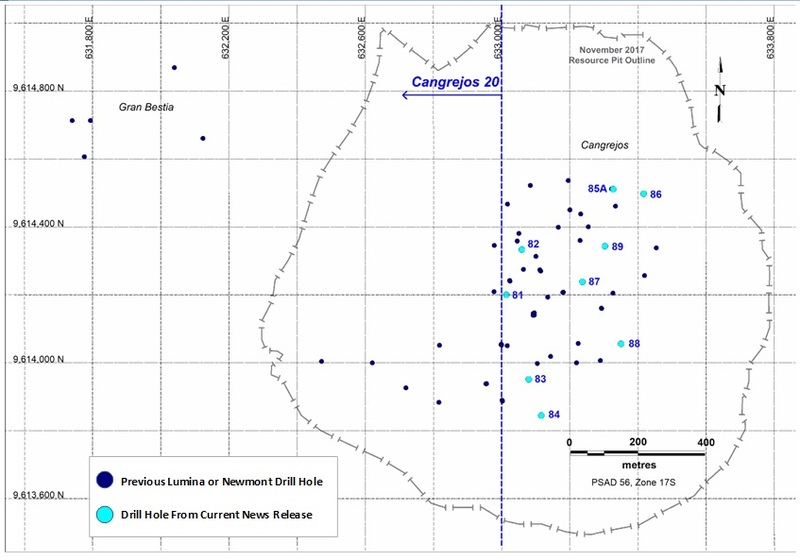 A second drill rig will arrive at site this month and it is expected that both drill rigs will begin testing targets on the C20 concession ("C20") shortly thereafter. 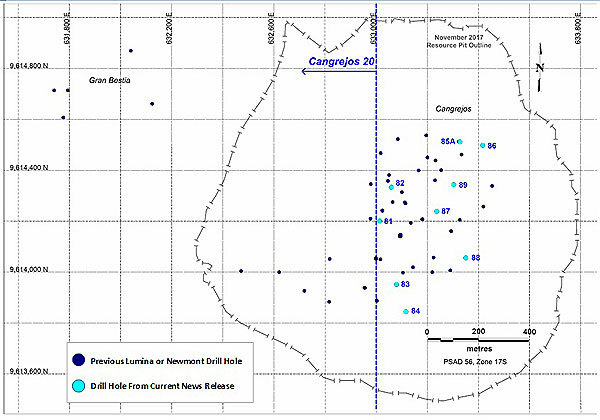 C20 has not been previously drilled by Lumina and represents substantial potential on the west side of the Cangrejos deposit. Hole C18-81 was collared near the C20 boundary in the northcentral sector of the resource and angled back to the southeast to test known surficial mineralization in the area, and to intersect a northeastward projection of the deep mineralized zone. The hole was successful in both objectives hitting a significant surface zone of mineralization from 16 to 200 metres averaging 0.88 g/t gold and 0.07% copper, and an additional 92 metres (from 614 to 706 metres) grading 0.46 g/t gold and 0.11% copper. The upper interval of the hole included 58 metres (from 74 to 132 metres) of mineralization averaging 1.71 g/t gold and 0.15% copper. C18-82, collared approximately 180 metres north-northeast of C18-81 (see map), was also drilled to the southeast to step-out on multiple zones of mineralization previously intersected in hole C18-73 (reported in NR:18-6 dated May 23, 2018). Similar to hole C18-73, hole C18-82 intersected several intervals of significant grade material throughout its length and included 156 metres averaging 1.16 g/t gold from 266 metres downhole. Holes C18-83 and C18-84 were step-out holes drilled along the southern flank of the deposit near the C20 property boundary. C18-83 cut significant mineralization from surface to 170 metres averaging 0.67 g/t gold and 0.18% copper. Hole C18-84 was collared 100 metres further southeast from C18-83 and contained intervals below the expected cut-off grade. Holes C18-85 (lost at shallow depth and re-drilled with 85A) and C18-86 were 100 metre step-out holes to the northeast, both angled to the northwest. Both holes hit significant mineralization leaving the deposit open in that direction. Additional drilling to the northeast is warranted. Hole C18-87 angled to the northwest from the central portion of the deposit and hit multiple long intersections of mineralization. Hole C18-89, a 100 metre step-out to the mineralization intersected in C18-87 also intersected numerous mineralized intercepts, including 222 metres averaging 0.55 g/t gold and 0.08% copper from 188 to 410 metres, confirming the continuity of mineralization in this sparsely drilled area. Note: Intervals in the reported holes are calculated using a cut-off of 0.2 g/t Au with maximum internal dilution of ten continuous metres. The highest gold value used in the reported weighted averages is 14.7 g/t Au. Above cut-off intervals of less than 20m are not reported. In addition to the above results there were multiple intercepts of lower-grade material in the drill holes. Certain statements and information herein, including all statements that are not historical facts, contain forward-looking statements and forward-looking information within the meaning of applicable securities laws. Such forward-looking statements or information include but are not limited to statements or information with respect to the arrival of a second drill rig at site this month and that both drill rigs will begin testing targets on C20 shortly thereafter. Often, but not always, forward-looking statements or information can be identified by the use of words such as "will" or variations of that word and phrases or statements that certain actions, events or results "will" or are "expected to" be taken, occur or be achieved.